Each shaft of hair is produced by a hair follicle. The cells in the hair follicle produce hair for about 2-3 years. 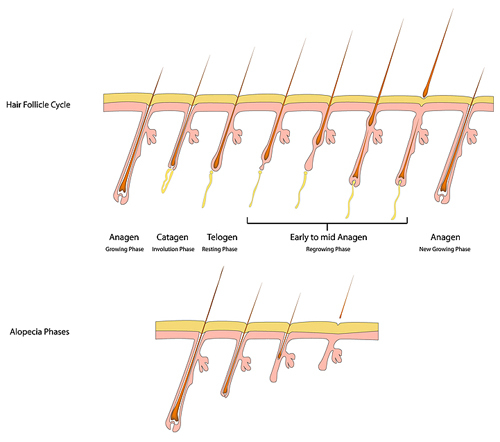 During this growth phase called “anagen”, each hair grows about 1 centimeter (1/2 inch) per month. After this growth phase, the hair follicle enters a resting phase called telogen during which the hair remains in place, but stops growing. This “resting phase” lasts about 3-4 months, after which the hair falls out. After the hair falls out, the hair follicle starts producing a new shaft of hair.